The latest version of Paint Shop Pro has been tweaked here and there since version 8. 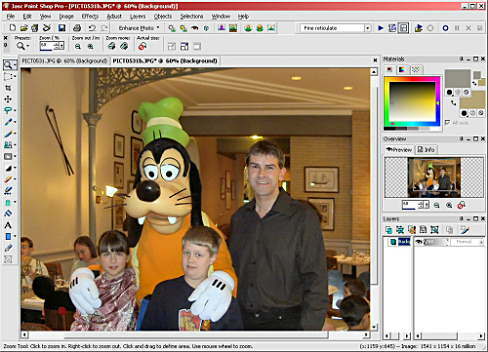 Jasc has also taken the decision to split the product into two versions, the regular version (which is the subject of this review), and a cut down version called Paint Shop Pro Studio. This is a light version to make it easier to use and edit your photos, but some of the features missing are the exact ones you would want. The Studio edition does not allow you to remove unwanted digital camera noise, eliminate the coloured glow that appears in high contrast areas of images, create seamless patterns and tiled images for the Web, create custom shapes that can be edited at any time (limited functions), mix your own colours and paint with realistic brushes, add screen captures to reports or manuals, animate Web graphics, record, playback, and edit commands, customise workspaces and toolbars and track each editing step and undo any step at any time. I can't say whether this is a good idea as I only had the full version to try. Installation was easy, and it doesn't matter whether you have a previous version already installed, as each one is in it's own directory. You could have three or four versions on your PC, but if you added any third party filters, you would need to point to the right directory for them. Requirements are a 300 MHz processor (1.0 GHz recommended), Windows 98SE, 2000 (SP4), ME, XP, 256 MB of RAM (512 MB recommended), 500 MB of free hard drive space, 16-bit colour display adapter at 800x600 resolution (32-bit at 1024x768 recommended), Microsoft Internet Explorer 6.0 or later. Selective Undo - you can selectively undo any action without affecting subsequent actions. Additionally, you can select and save steps as a Quickscript to be applied to another image, or copy to the clipboard. New Mixer palette - the Mixer palette offers a more natural, intuitive way for artists to create and pick colours. With the new Art Media brush tools and the new Art media layer, this gives a new way to digitally simulate real-world painting. New Frame tab - the Materials palette now contains the Frame tab, giving a new method of choosing colours. Tabbed Images - Open images can optionally be displayed in a tabbed format across the top of the workspace. This gives more space and easy navigation between several opened images. Docking palettes - Palettes can be set to slide open and closed from a tab along the right side, roll up at a user-selected speed, or roll up into the nearest quadrant of the workspace. More right-hand click options - the main workspace area right-click context menu now has more commands for enhancing control of the workspace, opening and closing files, as well as setting the preferences. Crop shading - the General Program Preferences dialogue has new options for the Crop tool's shading area, so you can see exactly what part of the image you are going to lose when you apply the crop. New Art Media Tools - these new tools let you create digital artwork that closely mimics real-world media, pigments, paints, and artist's tools. The Oil Brush creates realistic paint strokes, while the Chalk, Pastel, Crayon, Coloured Pencil, and Marker tools are used for making dry-pigment works of art. Image Browser Updates - two new tabs, Find and Info, have been added to the Browser window. The Find tab contains the familiar Windows Explorer-like navigation view, and the Info tab displays image information, creator data, and EXIF data. Additionally, with the Browser active you can choose File > Sort and use the Sorting dialogue to sort images by EXIF data. Raw Camera Image Support - you can now open raw (unprocessed) images from high-end digital cameras in Paint Shop Pro. Additionally, a new File Format Preferences tab contains an option for displaying a dialogue that allows for further raw image editing before the image opens in Paint Shop Pro. Digital Camera Noise Removal filter - this scans your photo and removes image noise often inherent to digital cameras while intelligently preserving normal image textures. You can even customise noise removal by defining specific regions or colour ranges to focus on or ignore, and then save settings as a Preset that can be applied to photos taken from the same camera. Chromatic Aberration Removal filter - this helps eliminate the coloured glow that often appears in digital photos, especially in an image's high contrast images. Fill Flash filter - this corrects underexposed, shadowy areas of your photos. Backlighting filter - this corrects the opposite problem by compensating for overexposed areas surrounding the photo's subject. Displacement Map effect - this lets you create two or three-dimensional surface effects using a different, underlying image as the basis for the effect. Radial Blur - at last, you can add interesting and fun spin, twist, and zoom effects to an image. This was always sorely missed from Paint Shop Pro. Even though you can use most PhotoShop filters with the program, this effect was never available as PhotoShop already had this function built in. Text Tool Updates - the Text tool now provides a vertical text layout option, updates to the text on a path feature, as well as new anti-aliasing rendering options that generate cleaner text at smaller font sizes. Print Layout Feature Updates - this now lets you draw a text box on the layout to easily add custom captions or titles to your printed pages. Additionally, you can create elliptical cells and apply edits to multiple cells simultaneously. Due to the limitations of how you might see these images, the effects may not be that noticeable, but they do have a dramatic effect on the image. I particularly liked the options in the radial blur where you can protect a percentage area from centre of the effect, which you can also move. 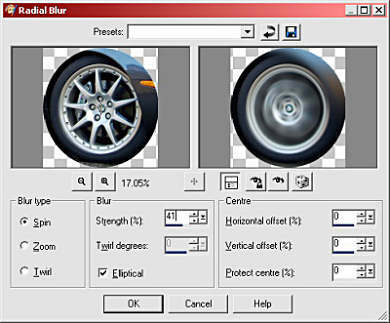 Pictures of static cars can now be easily turning into racing demons, with spinning wheels, although applying a motion blur to the background took several applications to get the strength of the effect correct. With the multitude of filters available, you can make a bad photo look good with Paint Shop Pro 9. You can't make an out of focus shot pin sharp, but that's true of any software package. The new art features require a bit of getting used to, and a pressure sensitive tablet would be of great help to get the best from them. With all the features at your disposable, you can do near enough anything that a Photoshop user can, and at around £85, it costs considerably less. If you have version 8, you might not want to upgrade as the differences are subtle, but I did notice that it loaded a bit quicker.